Well, I am a sucker for noodles. Be it Maggi or the regular chilly garlic noodles. I love them all. Hence I wanted to remake my chilly garlic noodles using spaghetti. Usually I use the egg noodles to make it, however this time I tried using the whole wheat spaghetti and was very content with the end result. It was not only healthy but also tasty. I tried to keep it as healthy as possible by using lot of veggies and less oil. 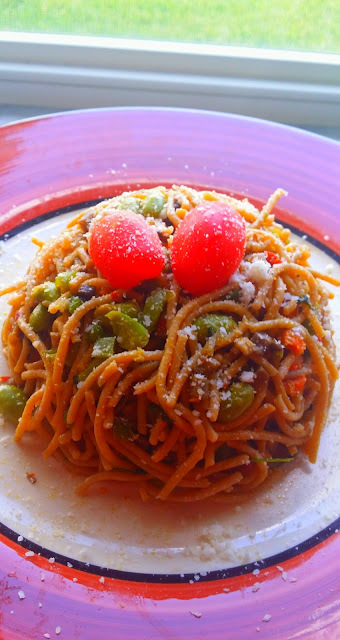 You can also use any other kind of pasta instead to make this dish. In a pan, cook the spaghetti as per instructions on the pack. Add salt and 1 tbsp olive oil while boiling it. Strain and keep it aside. In another pan, add 1 tbsp olive oil, fry the garlic till they turn golden brown. Add the edamame, spinach, mushrooms and capsicum. Fry for few minutes. Now add the chilly flakes, salt and cilantro. Mix well. Add the spaghetti. Mix lightly. Serve with Parmesan cheese sprinkled on top. Enjoy it just like that or with bread.